• The Sydney Harbour Bridge 1932. Required 272,000 litres of paint for the her coat. • How deep is Sydney Harbour under the bridge? One such hole, 45 metres deep, is located less than 10 metres offshore from Balls Head at Waverton on the northern side of the harbour, west of the Harbour Bridge. The deepest part of the shipping channel is just west of the bridge, off Dawes Point, to a depth of 40 metres. • The British settlement of Sydney was established as a penal colony by a naval fleet which landed at Botany Bay in 1788. • Phillip originally named the colony "New Albion", but for some uncertain reason the colony acquired the name "Sydney", after the (then) British Home Secretary, Thomas Townshend, Lord Sydney (Baron Sydney, Viscount Sydney from 1789). • As Sydney stretches over a distance it won't make sense to offer a few shoppings centre locations in the ctiy. • Food and Wine - Sydney is Australia’s flavour capital. You’ll taste authentic cuisines from around the world, thanks to the rich multicultural heritage in the beautiful harbour city. Deliciously tempting experiences range from waterside dining to neighbourhood ‘eat streets’, fresh produce markets and towering sky bars. There are hidden delights, too. Tucked away in the city centre is Angel Place, a meandering series of laneways with a paved area lined with charming restaurants and outdoor tables. Above the dining laneway is Forgotten Songs, an extraordinary artwork canopy of birdcages with recorded bird songs. 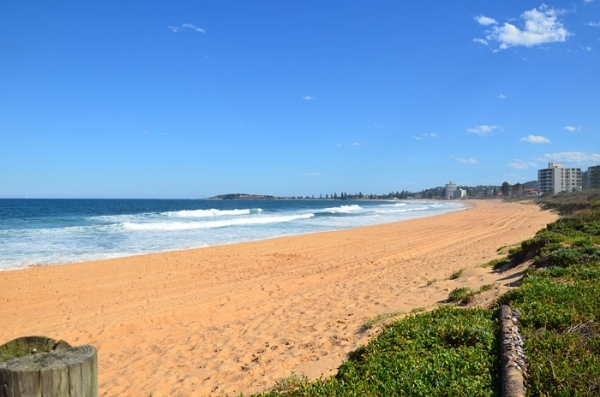 • For ocean views, check out the beachside cafes, bars and restaurants. North Bondi Fish overlooks the sand and waves at Bondi Beach, Australia’s most famous beach. How about combining harbour and ocean views? Well, you can with a scenic Rose Bay seaplane flight to waterside restaurants.Sydney is ideal for outdoor dining all year. Popular harbourside dining locations include the heritage-listed Finger Wharf in Woolloomooloo and vibrant Darling Harbour, where you can also visit a zoo and an aquarium. 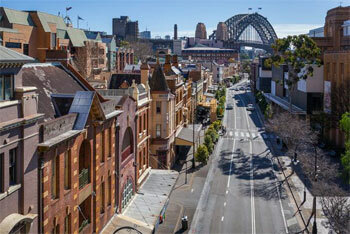 Milsons Point, Lavender Bay, Rose Bay and Watsons Bay are all popular as well. • Nature and Parks - Sydney’s natural wonders are incredible. Magnificent national parks, sparkling Sydney Harbour and majestic humpback whales, to name just three. The striking sandstone cliffs, the lovely sandy beaches and the myriad of colourful birdlife are three more natural features of the harbour city. There are gorgeous gardens and parklands, too. One of the best harbour foreshore walks meanders through the Royal Botanic Garden to the Sydney Opera House. There is a free guided tour daily of the garden, Aboriginal Heritage Tours several times a week and special plant exhibitions in the Calyx. • Other harbour walks include the Manly to Spit Bridge Walk on the northern side and the Hermitage Foreshore Track in Vaucluse on the southern side. On scenic coastal trails such as the Bondi to Coogee Coastal Walk there are vantage points to spot humpback whales on their annual migration. On the edges of Sydney, and right in the heart, are national parks. You’ll find wildlife, bushwalking trails to breathtaking lookouts and tranquil waterways for kayaking and fishing. There is precious Aboriginal rock art, including engravings of a sky spirit and a whale, and ochre hand paintings. The Royal National Park is Australia’s oldest National Park , established in 1879. 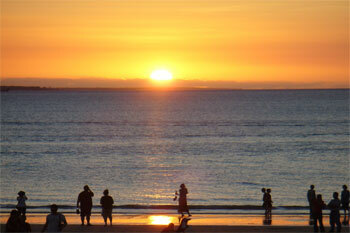 You can relax on secluded beaches, discover littoral rainforest and go camping. Small row boats are for hire from the Audley Boatshed to explore pretty Kangaroo Creek. Other national parks in Sydney include: •Kur-ring-gai Chase National Park for the Red Hands Cave walking track •Sydney Harbour National Park for exhilarating walking foreshore trails •Kamay Botany Bay National Park for whale watching at Cape Solander •Dharawal National Park for tours with an Aboriginal Discovery Ranger •Thirlmere Lakes National Park , a World Heritage area in Western Sydney •Lane Cove National Park for bushwalking, cycling, rowing and camping •Dharug National Park for a World Heritage convict trail in the Hawkesbury You can even go camping on a Sydney Harbour island. Cockatoo Island is a UNESCO World Heritage convict site, with a campground and tents. There are guided camping tours, too. 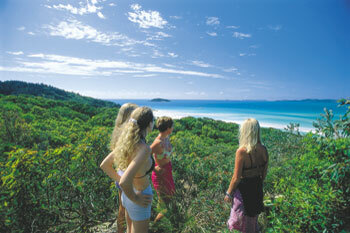 Join Life’s an Adventure, Sydney Coast Walks or EcoTreasures for a Sydney camping adventure in a National Park . One of the great natural wonders is the annual migration of thousands of humpbacks and other whales along the NSW coast, between May and November. Whale watching is popular on Sydney coastal walks and on special boat tours departing from Circular Quay, Darling Harbour and Manly. • Inner Sydney - From great theatre and beautiful heritage to ‘eat streets’, hip bars and designer boutiques, you’ll discover many fabulous things to do in lively inner Sydney. The events calendar is brimming with evocative shows, sassy cabaret, vibrant festivals and the world-famous Sydney Mardi Gras Parade. You’ll find delicious restaurants and cafes, too. The hottest dining spots include Kensington Street in Chippendale, King Street in Newtown, Darling Street in Balmain, the beautifully restored Tramsheds near Glebe, and Crown and side streets in Surry Hills, home to the acclaimed Belvoir Street Theatre. • More cutting-edge theatres are in Darlinghurst. The SBW Stables Theatre is in Nimrod Street and the Eternity Playhouse in Burton Street. For alluring cabaret, Slide is on Oxford Street where the two-week Sydney Gay and Lesbian Mardi Gras Festival ends with the glittering parade in early March. 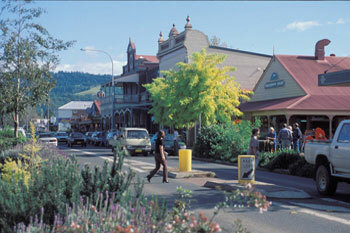 Weekend markets are another delightful drawcard of these charming neighbourhoods. 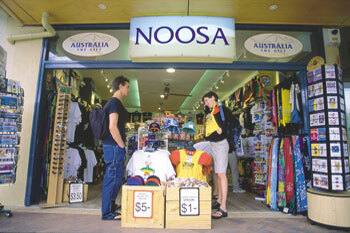 The popular Glebe Markets is on the ‘eat street’ Glebe Point Road in Glebe, near the University of Sydney. You can browse fresh seasonal produce at Carriageworks Farmers Markets in Eveleigh, near Redfern. The iconic Paddington Markets is in Paddington, home to stylish boutiques at the Intersection and along Oxford and William streets. Like many inner Sydney areas, Paddington has rows of Victorian terrace houses. You can walk to the famous Sydney Cricket Ground from the Paddington Town Hall. • A small section of this walk is in the 30km Sydney Harbour Bridge to South Head Walk, one of the great urban coastal walks in the world. The walk from Palm Beach to Barrenjoey Lighthouse is also outstanding. This Heritage Listed lighthouse was built in 1881 and is an iconic Sydney attraction. Another beautiful walk is the Bondi to Coogee Coastal Walk. The Federation Cliff Walk to Watsons Bays also offers postcard views of the Pacific Ocean and features Australia’s oldest lighthouse. You’ll also find dog-friendly walks and walking tours that provide fascinating commentary. For more splendid vistas south of the Coogee, enjoy the Malabar Headland National Park’s Western Escarpment walking track near Maroubra. The sweeping views of the rugged coast, deep blue ocean and Botany Bay are amazing, and the bush is teeming with wattlebirds, honeyeaters and fairy wrens. Hermitage Foreshore Track begins in Nielsen Park and winds past the heritage-listed Strickland House to Milk Beach, a small sandy beach and one of Sydney’s well-kept secrets. The walking trail offers stunning harbour views, including of Shark Island and the iconic Sydney Harbour Bridge. The Royal National Park in Sydney’s south is Australia’s oldest National Park and a bushwalking paradise. Sydney Coast Walks offers an Aboriginal discovery tour, where you’ll see rock carvings from a millennium ago. For campers and hikers, the Coast Track is a wonderful two-day adventure. In Sydney’s north is the Manly to Spit Bridge Walk, a 10km trail with superb harbour views, and the Manly Lagoon to North Head Walk. You can join EcoTreasures and Sydney Outback for walks in Ku-ring-gai Chase National Park . On the Red Hands Cave track are Aboriginal ochre hand paintings.